This book was on my Summer Reading List I posted a few weeks back, and I think was actually the first book I ever bought for the Kindle after hearing a story about it on NPR after the book was released in 2011. I'm glad I finally got to it, because it was simultaneously exactly what I'd hoped it would be and yet something I had not expected. Science Fair Season is a journalistic profile of a number of kids who competed in the 2009 Intel International Science and Engineering Fair (ISEF), and others who were either in their orbits or who had set precedents certain of these kids built upon. Lots of the summaries and press materials for this book talk about kids building nuclear reactors in their basements and creating flame-throwing robots. Those claims got me interested in the book in the first place, but they turn out to be either hyperbolic or amalgamations of different kids, which is a true shame, since I think the actual stories inside the book are far more compelling than the splashy blurbs they were shoehorned into on the book's covers. 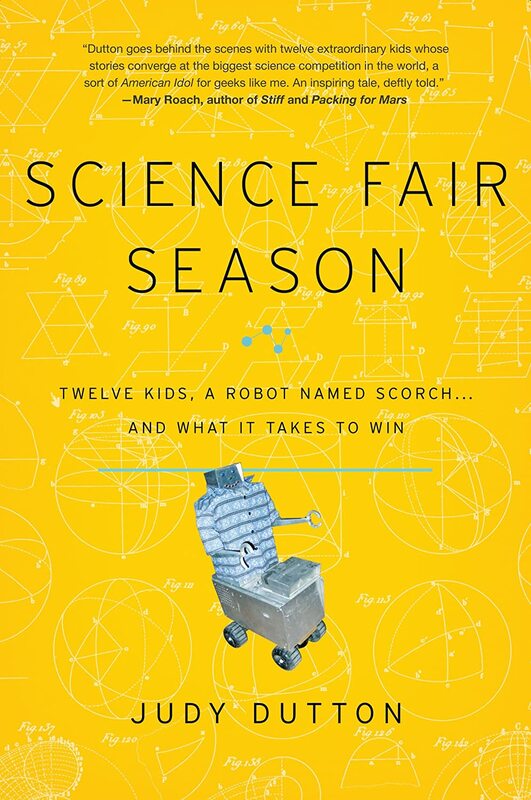 Author Judy Dutton interviewed and profiled kids who were among the 1502 competitors at the ISEF, digging into the paths that got them there, and where not only their projects, but their more fundamental involvement with the sciences, began. She then takes us to the competition itself, going into the presentations, the judging, and the awards ceremony, which has the power to utterly transform kids' lives. And these kids, man. I was expecting to be blown away by their outsized smarts, but instead, I was consistently floored, humbled, and heartbroken by their spirit. So many of them came from unimaginable hardship — abuse, dire poverty, medical trauma, social dysfunction, or familial upheaval — and yet each of them found a way to be uniquely true to him- or herself and accomplish feats of astounding imagination and sweat equity. One of the few failings of Science Fair Season, however, is in seemingly biting off a little more than it can chew, in terms of the number of individuals profiled. There are multiple kids who have an entire chapter dedicated to them who get no follow-up. Even with a "Conclusion" chapter that ties up a few loose ends, not getting a little more about what happened to some of the people left out of that section was frustrating. But more frustrating, and compelling, are the questions suggested in between the lines of all these kids' stories. Dutton does an extremely elegant job of bringing up larger social implications, trends, and failures without getting bogged down in these areas. Instead, the reader has to ask the next question, and ponder the implications of what is usually an ugly answer. For example: Several of the disadvantaged kids she profiles have no hope of attending college if they don't win/place/show at ISEF. This should be an outrage. We give so much lip-service to the idea that America needs to perform better in math and the sciences, and that we need more women in the STEM fields, and yet here, every year, is assembled a collection of the 1500 brightest young minds in those areas, many of them young women, and dozens of them will never be able to even attend college. It was five years ago Judy Dutton followed these kids around, and the introduction of abysmal Common Core teaching standards, the blossoming of the student debt crisis, the widening wealth gap, and the increase in the percentage of Americans living in poverty have all made the situation worse since then. As gut-wrenching as many of these kids' stories are, even more so is the knowledge that many kids just like them are tumbling headlong through the cracks — even kids that may have stood right alongside them at the nation's premiere high school science competition. I feel like a miser for doing this last thing, but I have to point out how poorly edited this book is. I only bring it up because this is a) a book about science, and b) the product of a Big-Five publisher. I'm not a scientist, but I am a nerd and I know enough to understand that atomic nuclei don't have electrons, you don't need formal musical training to hear the difference between one three-note piano sequence and another, and to catch several other factual slip-ups throughout the book. In addition, the word "hypothesis" is consistently used incorrectly, which either the author or editor confused with the "Ask a Question" step in the Scientific Method, and with so many kids leaving high school for college in this book, the persistent use of the grammatically incorrect (and infuriating!) "graduated high school" instead of "graduated from high school" made me want to pull my hair out. Nerd Coefficient: 8/10. We tend to be pretty tough with our scoring here, but this one gets a bump for its subject matter being particularly near and dear to our readership's heart. Posted by — Vance K, reader of over-his-head books about quantum physics, unapologetic lover of terrible movies, and Nerds of a Feather contributor since 2012.